Despite the obvious fact that eggnog is yucky, one of my roommates decided to host an eggnog party at our house before Christmas. Turns out that other people also like eggnog! Who knows what terrible event they suffered as children to develop such perverse tastes. But eggnog or not, a holiday party calls for holiday cookies, so I stepped up to the plate with sugar cookies and gingerbread squares. I sort of figured that my baking skills would translate into cookie-decorating skills. Turns out, not so much. 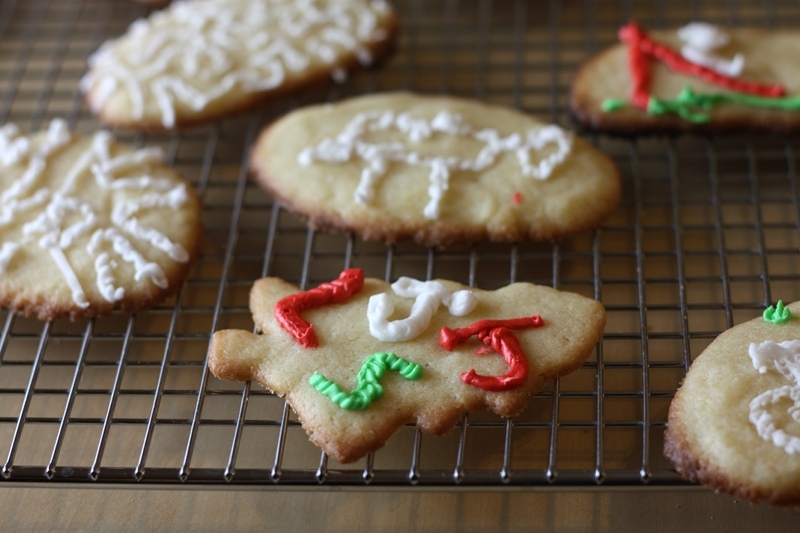 But to my surprise, decorating cookies seems to be a big hit with my guy friends, as may be evident from how they turned out: the artistry included several brains, a man with X’s for eyes, and a goat. Me and my unoriginal ways were responsible for the two identical candycanes. The resulting assortment was, um, unique! I don’t know if the recipe was a little off, or if I just don’t really like sugar cookies, but I thought they were just okay. 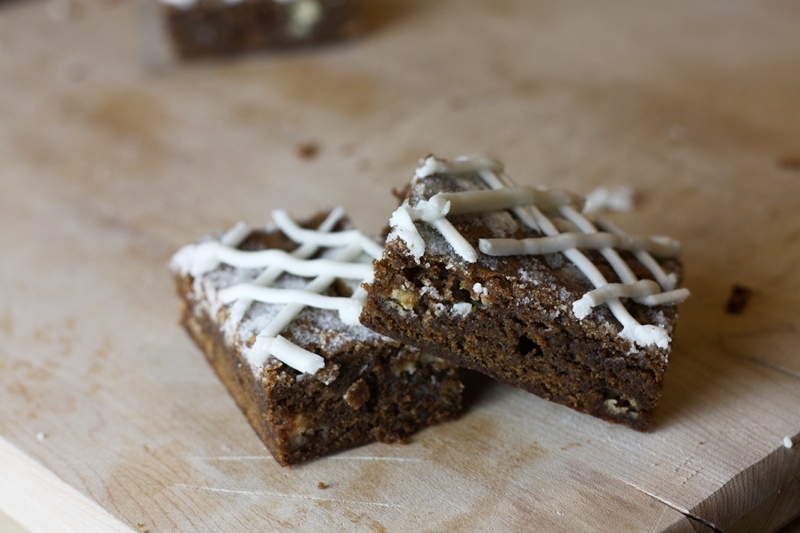 The gingerbread bars, however, were something else. Quite a change from the usual sweet Christmas fare, these were dense and warmly spiced. They’re drizzled with white chocolate cream cheese frosting, and went over quite well with the eggnog-soaked crowd. I shouldn’t have baked them quite so long though, so don’t take the instructions too literally – always check for doneness as ovens vary considerably. Also, the recipe I used for the icing was not great, and I doctored it heavily before using, so I’d just refer you back to my more trusted icing on that front. With those tweaks, I’d say this recipe is quite tasty indeed, even once the eggnog wears off. Preheat oven to 350°F. Line a 13×9 inch pan with foil and butter the foil. In a medium bowl, add flour. Scoop out 2 tablespoons of flour and place in separate bowl to reserve for topping. Into the flour (not reserved flour), whisk in ginger, cinnamon, nutmeg, cloves, baking soda and salt. Set aside. In large bowl, cream together butter and 6 tablespoons of granulated sugar. Add eggs one at a time, beating just to combine after each addition. Mix in vanilla and molasses. Add dry ingredients and mix until just combined. Stir in white chocolate chips if using. Scoop batter into prepared pan and smooth top. Sprinkle the top with reserved flour, then sprinkle the remaining 2 tablespoons granulated sugar. Bake until bars are golden brown and a toothpick comes out mostly clean with a few crumbs attached, about 20-24 minutes. Remove and cool completely on rack before cutting. When bars are cooled, lift the bars out of the pan using the foil. Using a ziploc or pastry bag with a small hole cut at the tip, drizzle white chocolate icing over gingerbread, then cut into bars. You will probably have leftover icing, and you’ll just have to figure out for yourself what to do with it. Whoever decorated some of these cookies was obviously just suffering from a lack of sleep. Or was tricked by the availability of all the different coloured icing. Or was drunk from the rum in the eggnog (which was extremely non-yucky). Or something. Because they can’t possibly normally be enthused by such things, no doubt having much more important and worldly things to occupy their time than drawing goats on cookies (a goat which, admittedly, they have every right to be rather satisfied with). wow! that brown showed up so nicely in your pictures! I love eggnog. I don’t consider it a perverse taste at all. Everyone has their preferences, I guess. You should try homemade eggnog. Anyway, the brownies look interesting. Happy new year. J – thank you for your comment, most anonymous person. You’re right, I deviously tricked my roommate by laying out innumerable bowls of brightly coloured icing. No one can resist! Judy – thanks!! you’re so right that brown is hard to photograph, but lately it seems like everything I bake is brown so I just have to do what I can. Memoria – I wasn’t being entirely serious. 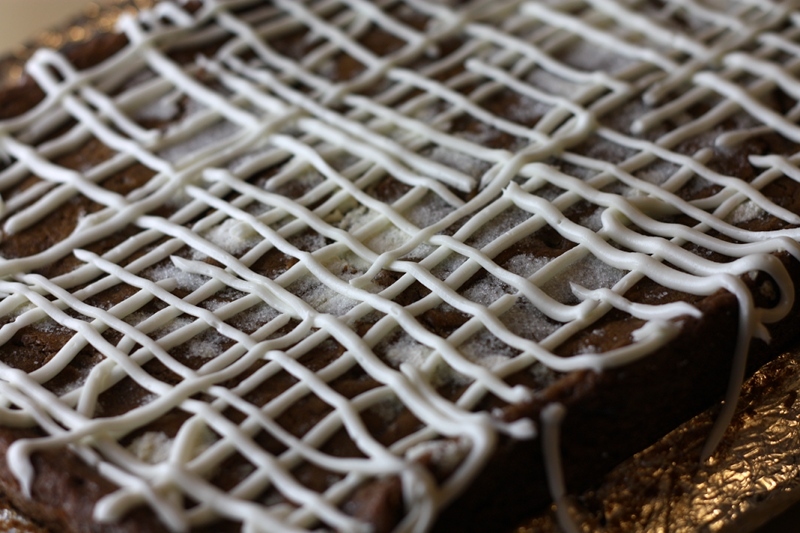 Goodness gracious, you’re making me want to bake those gingerbread bars all over again. And i’ve made them three times already! Beautiful pictures. Glad they turned out. You are currently reading nog and cookies at one cake two cake.